Above the AED: Use a triangular-shaped sign, like the one below, so you can see it from the various vantage points. Main entrance: Notify visitors that your organization has deployed AEDs and detail the locations. If your visitor is a trained responder and witnesses someone collapse, this sign may save a life. Restrooms: Staff may have a back route to the office and not see the main entrance sign, but everyone will visit the restroom. Intranet: Create an office/campus map for the intranet denoting AED locations. Fire/EAP Drills: While this isn’t a sign, continue to reinforce AED locations during all of your emergency training including new employee orientations, as well as fire and EAP drills. 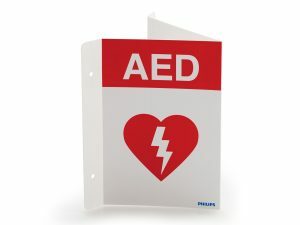 Proper AED signage shows your employees, guests and clients that you are prepared to save a life.